← Writer’s Digest running competition for YA and SciFi Writers! “The Next Big Thing” interview series is where six degrees of separation meets the literary chain letter and I have the distinct honor of being tapped to participate. I was invited by Lauren Sweet, editor extraordinaire and phenomenal novelist. Lauren worked with me after Askari won the San Francisco Writer’s Conference independent publishing competition. She whipped the original manuscript into something I can really be proud of…and an international award-winner! Lauren’s book, Aladdin’s Samovar is one of the greatest cross-genre books I’ve ever read. It is part action-adventure, crime drama, paranormal romance and comedy all wrapped into one. Sounds like too much? It’s not. Her outstanding ability to craft a well-woven storyline with remarkable and hilarious characters kept me enthralled and laughing to the point of tears. Between trying to fend off the Mafia, the FBI, and her growing feelings for Jasper the genie, Amber has her work cut out for her. People also get shot at, shrink wrapped, and stampeded by a horde of Happy Puppies. In other words, a good time is had by all. This is a trilogy, with YEZMAN currently being written and SHAELI probably a year behind it. Many places. After Twilight, it seemed like nearly everything written in the Young Adult genre was paranormal romance…there was little for teen boys to read. I wanted to write something that would interest my sons that would be fast-paced, complicated and exciting. I also wanted something that wasn’t a regurgitation of what had already been done…no elves, dwarves, unicorns, vampires, dragons or zombies. That’s difficult to say. Although I admit to using photos of different actors as models for certain characters, I find that the best movies are often done with unknowns. There is more room for actors to interpret their work when the public doesn’t have preconceived expectations. Star Wars and Harry Potter both starred relative unknowns and were tremendously successful. Please give a short synopsis of your book. Cedron doesn’t fit in anywhere. His mother’s people cast him out and his father’s people want him dead. He’s a demon with the power of the deities and no clue how to control his abilities. Hunted and on the run, Cedron forms an uneasy alliance with Raika, a warrior with her own questionable agenda. Together, the two undertake a perilous journey to fulfill their personal destinies before the ancient evil that is threatening to overrun their land destroys everything. The draft that won the San Francisco Writer’s Conference took seven years to create. Muralia is a new world filled with unique features, creatures and peoples. It took another year of fine-tuning with an editor before I felt comfortable releasing this book to the public. I loved the stories from the Arabian Nights and the films about Sinbad the Sailor. I’ve always been fascinated with Persian and Middle Eastern culture, language, food and mythology. I wanted to write an adventure like those that made my heart pound in fear or weep in the face of tragedy. My heroes should be clever, irreverent and flawed but with redeeming qualities that make me want to cheer them on; like Sinbad, Aladdin or Ali Baba. Askari is Arabic for “warrior” and much of the inspiration for this trilogy comes from the Middle East. For more inspirational images, see my PINTEREST Writing Inspiration board. What else about your book might pique the readers’ interests? Cedron Varkaras in a letter to Sarohra from the Zigorman Marsh. Hello, Mikko. 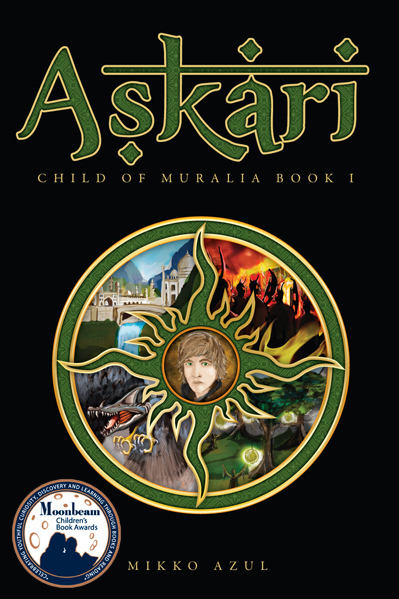 ASKARI, Child of Muralia, sounds fantastic. I also grew up loving Arabian Nights so I think I am going to love this book. Not everyone realizes how much work and research goes into a book like this, even when it is fantasy and a lot of the world building is your own. So looking forward to reading. Nice interview! (And I learned some things about the genesis of Askari that I didn’t know, too!) Thanks for your kind words about Aladdin’s Samovar. I should hang out here more often–I didn’t know about the Moonbeam award. What a wonderful honor.